Work has progressed well in Trenches 15, 14, 18 and 19, with a large extension to Trench 19 opened to investigate elements of the burnt mound/spreads and a possible structure identified through the geophysical survey. Excavation in Trench 17 (Bone Passage) has also continued, but with few finds recovered compared to the excavations in Trenches 1 and 6, which took place between 2004 and 2006. 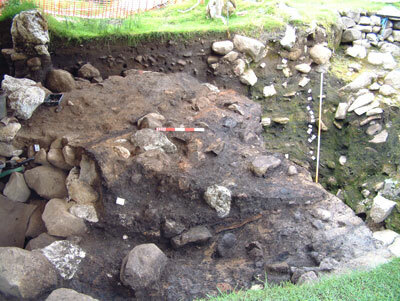 The image above shows Trench 19 after removal of the turf from the east. 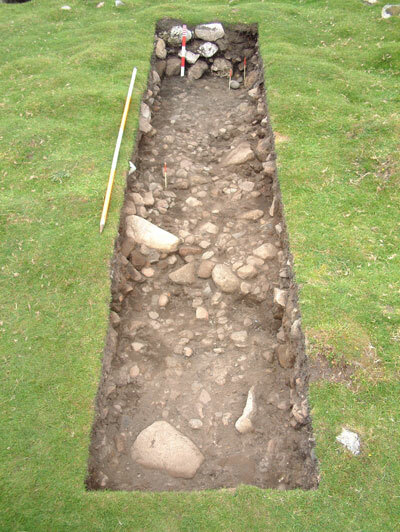 The main reasons for extending this trench is to investigate a fairly level area to the northeast of the stairwell entrance that appears to be defined by a circular enclosure wall, in which a possible rectangular-shaped structure was detected by geophysical survey in 2006. Work in this area of the site will also allow us to sample a larger area of the burnt mound/spread, to investigate the morphology of this feature and allow us the opportunity to look for earlier features cut into the natural karstic clay. 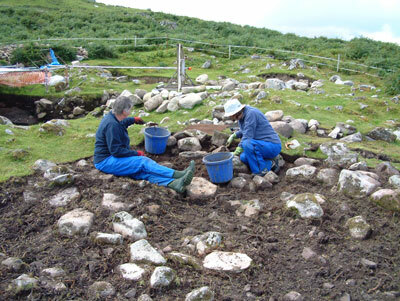 The image above shows Sue Watkins and Ann Gilbraith, local volunteers from Skye, tackling the bracken root infestations that plague the initial cleaning of trenches before the initial recording stage of work. 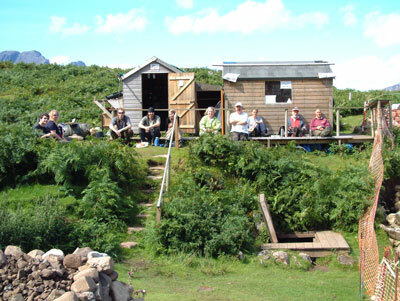 The bracken roots are particularly bad around the stonework visible in this picture, taken from the northeast, which may represent a later degraded wall feature that defines the enclosed area of ground. 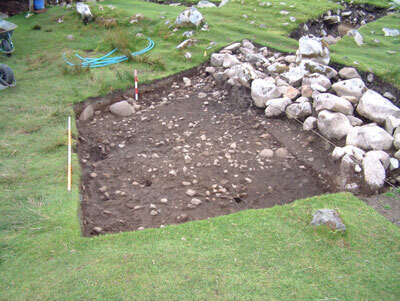 We hope to clean the trench and record all of the features and visible stone before the end of fieldwork this year. 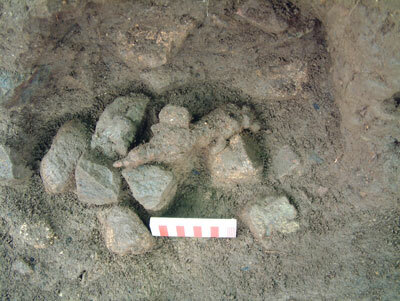 Excavations in Trench 18 have continued to investigate the burnt mound/spreads in the eastern sector of the site. 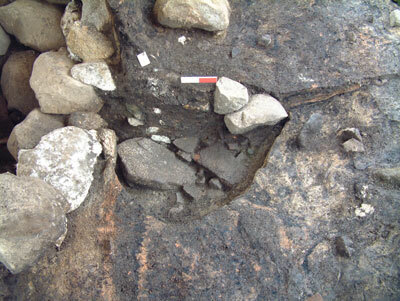 The image above shows the main deposit of fire-cracked stone after cleaning. However, few finds have been recovered from this trench with the exception of a few degraded shards of pottery, two half fragments of rotarty quern stone manufactured from a schist-type stone, some burnt bone and fragments of charcoal. 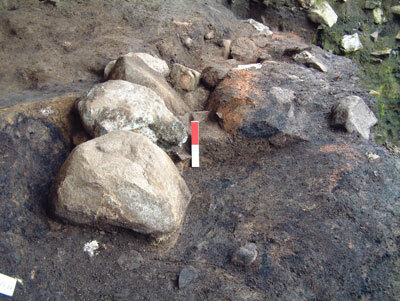 The image above shows the trench after removal of the main burnt mound material, comprising compacted fire-cracked stone and pebbles. 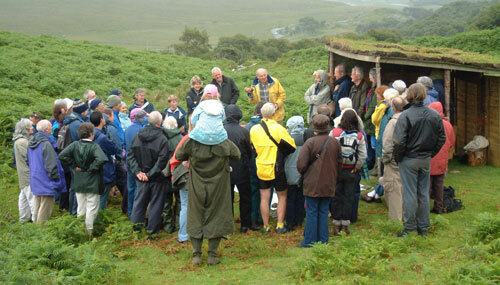 Below this we encountered a thin lens of a grey, silty sediment containing small fragments of charcoal. This was found to overlie the natural karstic clay, into which had been cut a small stake-hole. This was filled with the grey clay and a darker brown sediment. 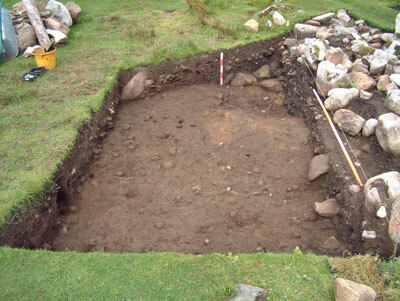 The location of the stake-hole is marked by the small scale in the image below, at the far end of the trench. 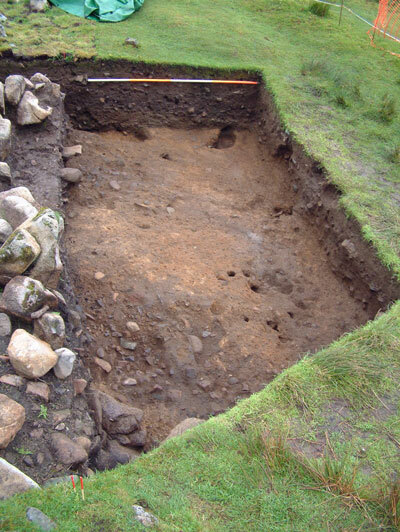 The image above shows the surface of the burnt mound uncovered in Trench 14, below the removed structure of Shieling number 2. Since this time excavations in the trench have focused on removing and sampling the deposits of fire-cracked stone and pebbles. Unfortunately, these deposits have witnessed the activities of rats in the past, which have left the calling card in the form of burrows and runs. These have resulted in the mixing of layers in some areas, but elsewhere the deposits are undisturbed and secure. In the image above, the dark upper burnt mound deposits have been removed to reveal the surface of the lower burnt mound (brown). The stone in these lower deposits is more abraded and not as fresh-looking as in the upper layers, and may represent some of the earliest deposition of this material in this part of the site. 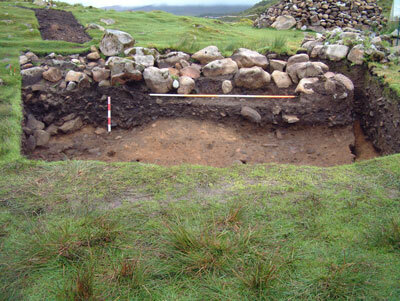 The relationship between the walls of the shieling structure and the underlying burnt mound material can be seen clearly in the image below, with the floor of this structure utilising the surface of this deposit. We have had few finds from this trench, which was not expected as we had recovered pottery shards and a fragment of vitrified ceramic crucible from an adjoining area of the site. 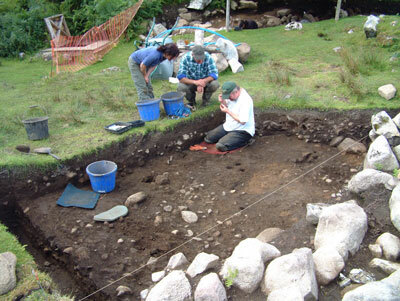 However, in the image below, Martin Wildgoose and Carol Dickson watch on as George Kozikowski uses a small magnifying glass to inspect a possible piece of flint. During her work on site, Carol recovered few small finds. But while working in Trench 14 she uncovered a small iron concretion in the southwest baulk of the trench, located on the interface of the upper surface of the lower burnt mound deposit . After careful cleaning, the object was revealed (see below). In order to lift the object before the onset of the weekend, Carol had to carefully remove the surrounding burnt mound material. The object was then lifted along with the fragments of fire-cracked pebble to which had become attached. The image below shows the object from above before lifting. We have now recovered a nice selection of iron objects and concretions from the site during this years excavations, all of which will be submitted for x-ray analysis and conservation treatment. With the removal of the archaeological layers forming the lower burnt mound material in Trench 14 a bank of the natural karstic clay was revealed towards the centre of the trench, while in the northwest baulk a short section of collapsed revetment wall was revealed (this disappears into the baulk of the trench to the NE and SW). While cleaning the area around the wall, George Kozikowski recovered a large fragment of shale that had been worked. This appears to be waste material from the manufacture of a shale bangle or bracelet (image forthcoming in the ‘Finds’ section). Otherwise, finds from the trench remain elusive. 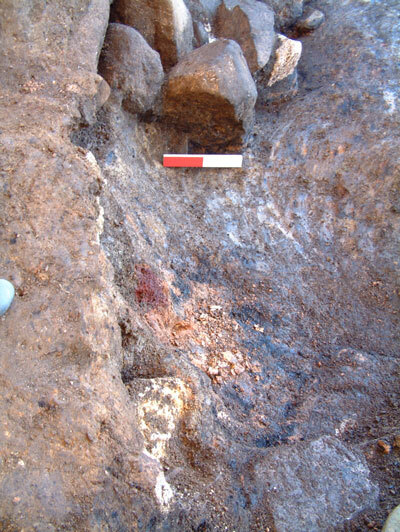 With further excavation, what appeared to be more of the natural karstic clay was revealed in the base of the trench and this helped to define what looked like cut features or natural hollows filled with compact deposits of fire-cracked stone. 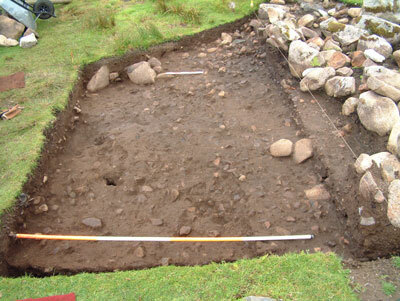 In the image above, the short section of revetment wall can be seen in the left-hand corner of the trench and immediately to the right of this is one of the possible features marked by the upright scale. The image below shows the trench from the northwest, with the wall nearest to the camera and the possible cut feature just beyond. 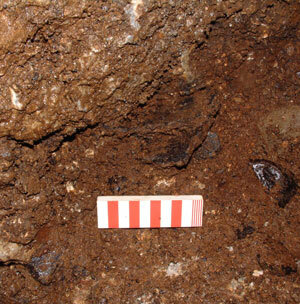 The activity caused by burrowing rats can also be seen clearly, while at the far end of the trench the second dark area of sediment containing compacted fire-cracked stone can be seen. 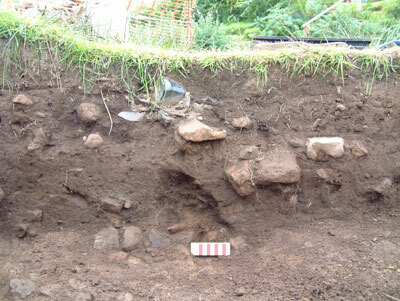 At the far end of the trench, features excavated earlier in the year can be seen - the cut to the right is a possible post-hole that produced a worked piece of Rum Bloodstone. The wall and adjacent cut feature are shown from above in the image below. The shale manufacturing waste was recovered from the area between the stone forming the low revetment wall. 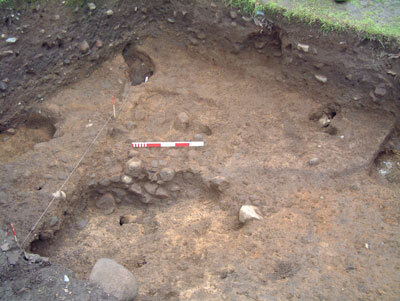 Although this feature will have to be investigated further through excavation, it is possible that it may have formed a revetment for the burnt mound/spreads. If so, then the deposits of fragmented stone have over-run this feature, running into the natural hollows of the karstic clay below. As we investigated these features and excavated sections through them, these features appeared to be more complex than first thought. 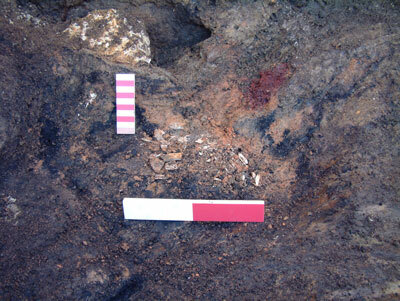 In some areas of the trench, what we first identified as the natural karstic clay turned out to be thin lenses of mixed archaeological deposits overlying a compacted layer of fire-cracked pebbles and stone. These were interspersed with fine layers of a grey silty material containing some small fragments of charcoal and burnt bone. Sophie Laidler, one of our student volunteers from the University of Newcastle, can be seen in the image above excavating within this complex area of Trench 14. In this image, Sophie is cleaning away a thin layer of the yellow-coloured mixed karstic clay deposits to reveal the fire-cracked stone below. Further work is required in this trench to allow us to fully understand the depositional events that resulted in the formation of the burnt mound/spreads and we will report back on this before the end of the fieldwork season. Elsewhere on site Trench 15, the excavations investigating the forecourt area immediately outside the stairwell entrance to Bone Passage, are making steady progress. The archaeology in this trench has proved complex, but we are starting to unravel the sequence of depositional events that created the unusually deep stratigraphy in this part of the site. Excavations within Trench 15 earlier this year (see update in July) revealed a complex of superimposed walls and ephemeral stone-built structures (see image above). At the south end of the trench, adjacent to the entrance excavated into the cave by speleologists in 1970, we have uncovered two revetment walls. 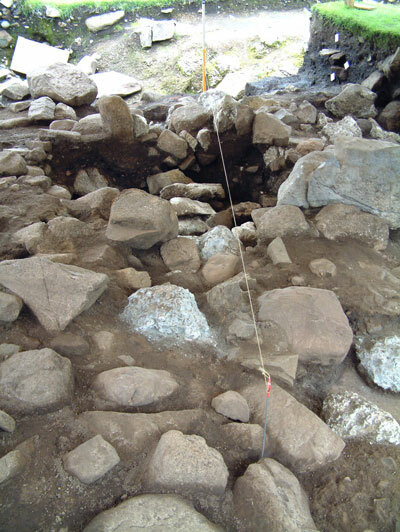 These appear to respect, and relate to, this former entrance into the cave and we now think it is possible that both this entrance and the entrance utilised by the stairwell were open during prehistory. We know that this area of the site still floods after very heavy rain, due to the cave sink being unable to take such amounts of freshwater run-off. Therefore, is it possible that these two walls are an early attempt to direct water into the secondary entrance (’cavers entrance’) into the cave, diverting it away from the original cave entrance used as the main point of entry and for the deposition of material? At the moment, this appears to be the only logical explanation for these structures. 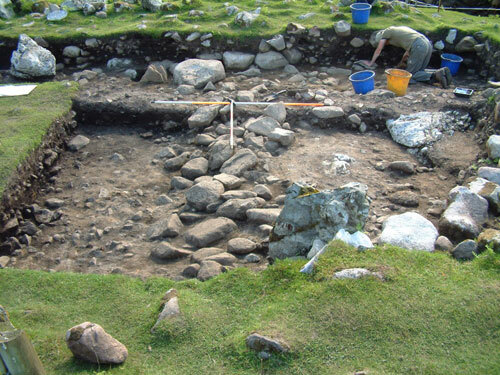 Within a central position within Trench 15 we have also uncovered another section of partially collapsed drystone wall, built of limestone and granite slabs, which may also be some form of partition or enclosure wall. Originally, this appeared as a small stone-built cell, with two upright stone posts on the side nearest to the stairwell (see image above). This structure, which only comprised up to two courses of stonework, overlay more substantial walling and deposits of ash, charcoal and fire-cracked stone. On the stairwell-side of the structures we started to uncover the deep deposits of ash and residues from burning activities, and such was the complexity of these deposits and the necessity to understand the relationship between these deposits and the structures, we decided to excavate a section through the archaeology. 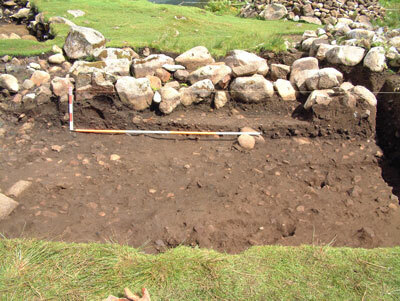 This initially revealed the ash and burnt deposits running over and below a revetment wall of up to two courses of stonework - possibly an attempt to contain the ash layers or to enclose and define the area immediately outside the stairwell. After removal of this wall, we found the ash layers running up against the larger wall of limestone and granite boulders (see image below). Eventually, this revealed more of the complex ash deposits, some of which may have been isolated dumps of residues from fires on site. 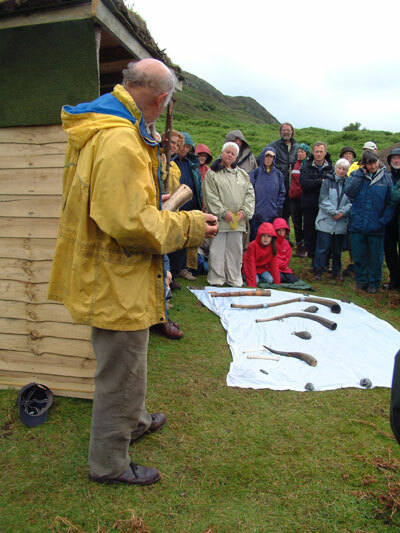 It also became apparent that there had occurred some significant subsidence within this area of the site, possibly due to the underlying stone and boulder fill of the natural hollow over which the ash layers had been deposited. From the northern edge of the trench, the layers of ash were found to dip down at a considerable angle to where they ran up against the boulder wall. The clay-like ash layers had deformed in this area, appearing to run up vertical against the wall face. The subsidence in this area had also allowed the wall to lean towards the ash layers (we initially thought that the wall had possibly been constructed in this manner, holding back the ash). 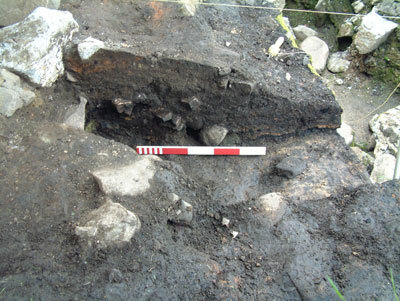 It was during the excavation of the ash layers running up against the wall that we uncovered what appeared to be a cut feature (see image above). 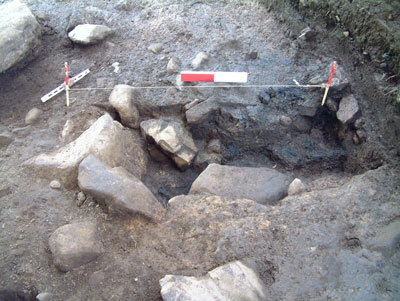 We carefully excavated the feature, revealing an oval shaped pit that had been cut through the ash and charcoal deposits. 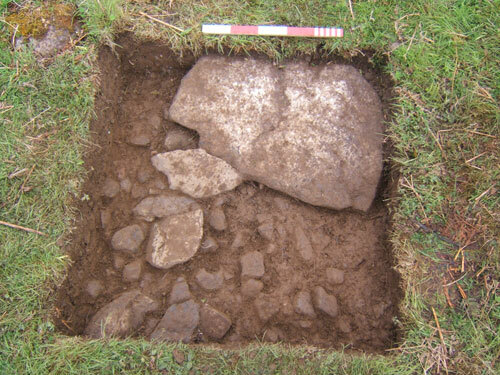 Initially, we sectioned the pit revealing the mixed sediment and stone fill of the feature, and stonework of flat slabs in the base (see image above). 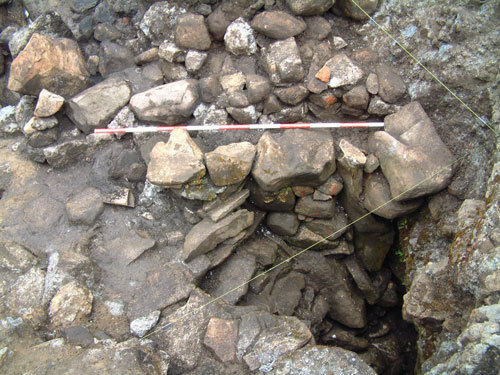 After recording the section, we then emptied the remaining contents from the pit to reveal a slab-built hearth setting surrounded by fire-cracked stone, while at the centre of the hearth we uncovered the ash layers from the last fire to be set in the pit (see below). After recording, we then excavated the hearth setting and sampled the remaining deposits within the pit, to obtain potential material for dating purposes. 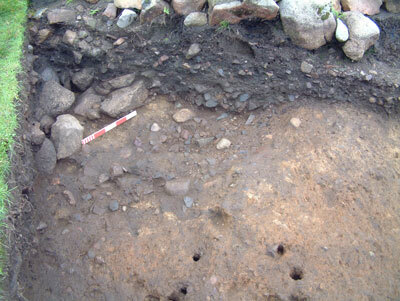 The hearth slabs lay on a grey clay layer in the base of the pit (see image below). Several shards of Iron Age pottery was recovered from the upper fill of the pit, while we also found a worked antler tine and some fragmented animal bone in the lower deposits. During the excavation of the ash layers surrounding these features we collected bulk samples of sediment for analysis, while we also processed samples through wet-sieving. Samples from the pit were very rich in burnt cereal grains, in particular barley, while one of the thin black lenses sandwiched between the orange ash layers produced burnt cereal grains, significant amounts of hazelnut shell (including some full shells), and other burnt plant residues such as fruit pips and what appeared to be straw. One other potentially interesting find was a small cylindrical glass bead that was green in colour. 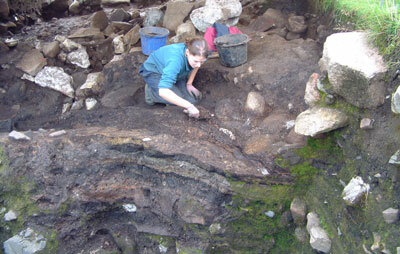 The image above shows Gemma Cruickshanks, a volunteer from the University of Edinburgh, excavating the complex ash layers in Trench 15, while the image below shows one of the smaller lines of boulders embedded within the ash that may have formed simple revetments to contain these deposits. During the excavation of the ash layers that run up against the boulder wall Gemma uncovered a large piece of burnt wood, which required careful work to remove in one piece. 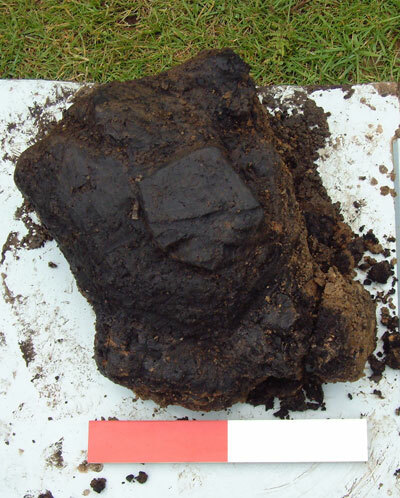 The object also appeared to have evidence of working, or cut-marks on it, and these became more obvious after removal from the archaeological deposits (see below). In other parts of Trench 15 we have recovered some superb samples of charcoal, while Tom Elliot excavated a pit-like feature in the southwest sector of the trench. 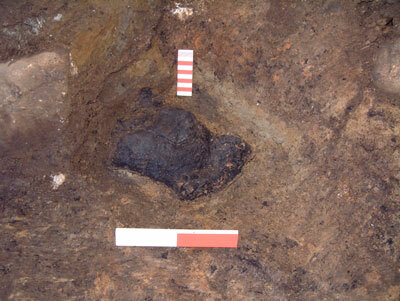 This was originally identified as a possible post-hole with burnt wood deposits (see image below). 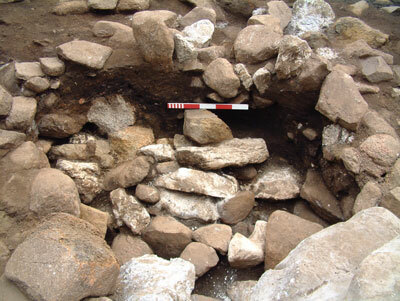 But after excavation, the feature turned out to be some form of stone-lined pit containing some large lumps of charcoal and medium to large stones. 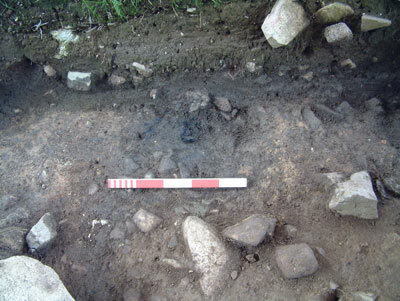 The image below shows the feature after section excavation by Tom, during which he recovered a nice flint flake. During the excavation of the ash layers running up against the wall at the north end of Trench 15, Gemma also uncovered two discrete deposits of cremated bone. We cannot be sure at the moment whether these are human or animal in origin, but their location in the trench and within the ash layers is intriguing. 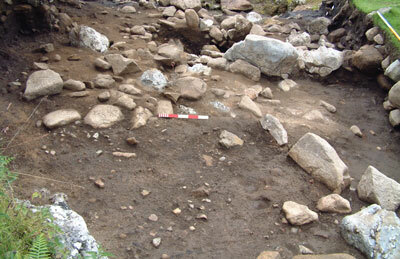 The image above shows the location of the cremated bone deposit (in the foreground), which lay below a large granite slab that may have formed part of an hearth setting. 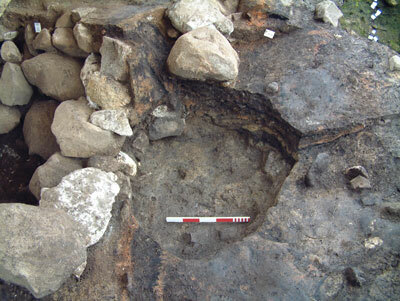 The image below shows a closer view of the deposit in-situ before removal. We will have to wait until next year to receive any analytical results from this deposit. We are now also starting to concentrate our excavations in Trench 15 at the south end of the trench, where we are still uncovering deposits of burnt mound material comprising fire-cracked stone and pebbles, interspersed between larger stone clasts of limestone and granite. 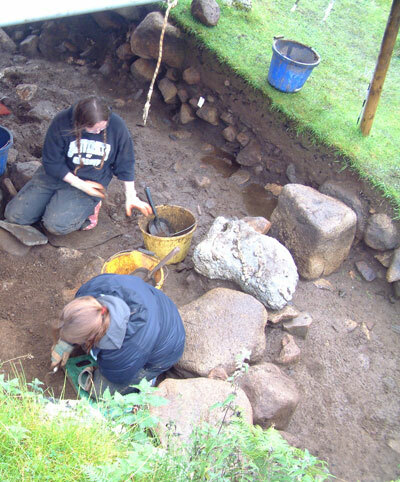 The image below shows Louise Gamble and Georgia Davies, site volunteers from the University of Glasgow, excavating in this sector of the trench, to the north of the inner revetment wall.